Grease a 2lb loaf tin or 18-20cm round cake tin and line it with greaseproof paper or baking parchment. Mix the lemon rind and caster sugar together. Cream the butter with the lemon and sugar mixture. Add the eggs and mix until smooth. Sift the flour, baking powder and salt into a bowl and fold a third at a time into the mixture. Turn the batter into the tin, smooth the top and bake for 1 1/2 hours or until golden brown and springy to the touch. To make the syrup, slowly heat the juice with the sugar and dissolve it gently. Make several slashes in the top of the cake and pour over the syrup. Sprinkle the shredded lemon rind and 1 teaspoon granulated sugar on top and leave to cool. 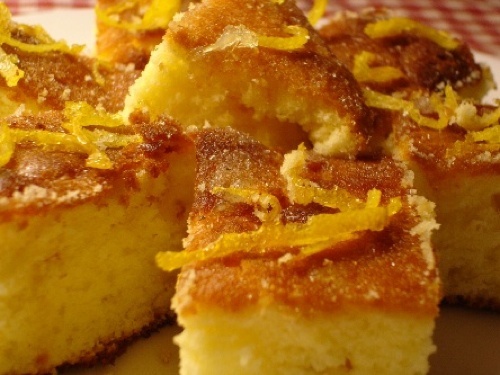 You can also make this recipe using a large orange instead of the lemons; either way - it's a terrific citrus cake.